Honorary casket-bearers were Mr. Klepel’s granddaughters, Kira Stewart and Nycole Mouritsen. Casket- bearers were Mr. Klepel’s grandsons, Callen Mouritsen, Kyle Klepel, Kaleb Klepel, Dalton Mouritsen, Justin Klepel, Jordan Klepel, and Kendal Mouritsen. Mr. Klepel was born May 5, 1940 in Ortonville, Minn. He was the son of Richard Erick Wilhelm and Luella Lydia (Oehler) Klepel. Mr. Klepel was baptized as an infant May 26, 1940 and was later confirmed in his faith as a youth June 6, 1954. 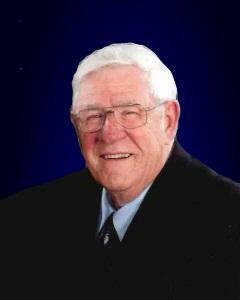 He received his education at Odessa High School, and was a graduate of the Odessa High School Class of 1958. Mr. Klepel furthered his education at Saint Cloud State University with a bachelor’s of science in business degree, physical education and coaching. He earned a master’s of arts degree in education administration and curriculum from the University of Minnesota. Mr. Klepel entered active military service in the United States National Guard June 7, 1958, and served his country at Fort Riley, Kan. during the Vietnam War. He received his final honorable discharge April 30, 1966 from the United States Army Reserve. On Sept. 9, 1961, Mr. Klepel was united in marriage to Ethel Brandt at St. Peter’s Lutheran Church in Bellingham, Minn. This marriage was blessed with two children, Brant born May 4, 1964, and Branda born Sept. 4, 1968. David and Ethel resided in Brownton and shared 56 years of marriage. Mr. Klepel was employed as a gravel truck driver in Ortonville, Minn. in the summer of 1959 and then was employed as a tow motor operator at Big Stone Canning Co. in Ortonville in the summer of 1960. David was employed as a men’s clothing salesmen and warehouse order filler at Sears in 1962. Next, he was employed as a seventh- and eighth-grade teacher at Blomkest Elementary from Aug. 1962 to June of 1965. Mr. Klepel was then employed as a secondary principal at Bellingham Public School from July 1965 to July 1967. From July 1967 to December 1995, he was employed as a superintendent at several public schools, such as Big Stone City, South Dakota, Marietta, Minnesota, Brownton and McLeod West. After 33 years of public school administration and teaching, Mr. Klepel retired July 1, 1995. He served as a member on the State Board of the Minnesota Association of School Administrators. He also served as a member of several organizations such as Brownton Civic and Commerce Administration, Minnesota State High School League, Brownton City Council, Brownton Housing Corporation, and Brownton Parent Teacher Society. Mr. Klepel enjoyed playing Odessa town team baseball, dancing, going to auction sales, restoring antiques and collecting hats. He also enjoyed traveling, playing cards, watching the Minnesota Vikings, attending Brant and Branda’s athletic events and going to their mobile home in Arizona over the winter months. He had a passion for family history. Mr. Klepel especially enjoyed spending time with his family, grandchildren and friends. Mr. Klepel is survived by his: wife, Ethel Klepel of Brownton; children, Brant Klepel and his wife, Darla of Mantorville, Minn., Branda Mouritsen and her husband, Steve of Fergus Falls; sister, Marjell Wendland and her husband, Jim of Baltic, S.D. ; brother, Marlowe Klepel of Odessa; grandchildren, Kira Stewart and her husband Ryan of Kasson, Minn., Callen Mouritsen of Grand Forks, N.D., Kyle Klepel of Des Moines, Kaleb Klepel of River Falls, Wis. Dalton Mouritsen of Minneapolis, Justin Klepel of Mantorville, Minn., Nycole Mouritsen of Fergus Falls, Jordan Klepel of Mantorville, Minn., Kendal Mouritsen of Fergus Falls, and many other relatives and friends. Mr. Klepel is preceded in death by his parents, Richard and Luella Klepel; and sister-in-law, Judy Klepel. Arrangements by the Dobratz-Hantge Chapels in Hutchinson. Online obituaries and guest book available at www.hantge.com.